I just cooked two pieces of very fresh, wild caught swordfish at 54.5 C for 1 hour. They were 3 cm thick. I put a little bit of chicken fat, salt and lemon slices in the bag. I think the fish was overcooked. Not rubbery but just too dry. What time/temperature shall I try next round. Any suggestions for Halibut (same thickness)? Thanks. For anybody who is interested, I am using the Sous Vide Supreme. I have stayed with it for hours and watched and I am amazed at how consistent the temperature is. It always seems to stay within .1 or .2 C of the target temp and most of the time it is right on. The rack that comes with the SVS solves the floating problem though I am very good at getting the air out of my vac packs notwithstanding that I am using a food saver. I recently purchased an SVS and entered the world of sous vide and have a few questions. So far I've done some chicken and steaks. The chicken I did at 147F for 2 hours. It was most for the most part but the very center was a little dry. I did it with just some salt and pepper and butter and the taste wasn't anything amazing. I realized that chicken isn't like steak or salmon where the taste of the meat itself is great. Chicken tastes like...well... chicken. I think if I brine the chicken next time and add some flavor to it and lower the temp by a few degrees it will turn out well. The steak I was disappointed in. 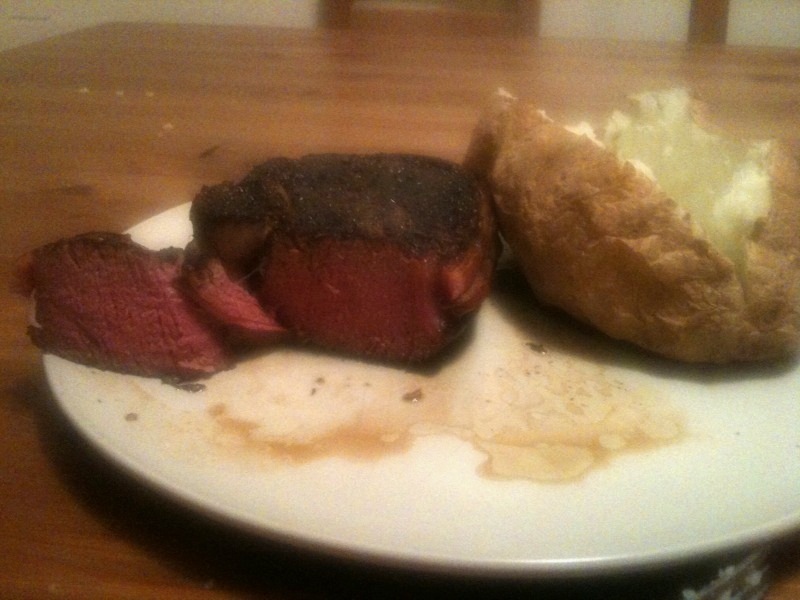 I got a nice fillet about 14oz, wrapped in bacon and seasoned. I did one like this 2 weeks ago that was the exact same size and prepared the same but cooked in the oven. I cooked it at 200 degrees till the temp hit about 117, then seared it in a 550 degree oven in cast iron pan for 3 minutes on each side. It was amazing. So juicy and flavorful it blew my mind. So today I did one in my SVS figuring it'd be even more amazing. I threw it in at 131F before I went to work. It spent about 11 hours in there till I was ready to cook it. When I opened the bag and pulled it out there was a fair amount of liquid in the bag, that red, blood looking liquid that's common with steak. I then put it in the oven at 550 and seared it in the same way. The bacon wasn't quite cooked (I expected that) so I took my torch to it (first time using). It really wasn't that impressive, the one in the oven was a sure winner. The best way to describe it was that this one was very moist and tender, but the other was juicy. With the other after the sear resting on the plate under foil a fair amount of juice collected on the plate, but plenty was left inside. This one there was no liquid on the plate, which first had me very excited since I figured it was all on the inside. However, I was dismayed when not a single drop of juice was left in the steak. It wasn't dry by any means, just not juicy. I feel like that bag full of juice I threw out before searing took a lot of my flavor with it. I always assumed cooking in the bag would keep the juices in the meat and you'd end up with a more juicy steak. Instead, even the steaks I cook on the grill that are constantly dripping juice to be destroyed by the flames are more juicy than this steak was. The bacon didn't turn out well either. The torch kind of blistered the outside a bit but it was thick bacon and the inside part of it was still not quite cooked. I'm not giving up complete hope. I'm going to maybe try cooking at 123F or 125F for only 4 hours, and cooking the bacon a little in the oven first before wrapping it and searing. Does anyone have any tips for this rather sad SV noobie? I'm going to try some scallops (50c, then browned) and Lobster (with beurre monte) tomorrow to see if I can get some better results. However, steak is my specialty and I am a bit dejected that it didn't turn out better than what I can do in the oven or on the grill. I've already learned a lot from this site and hope to learn lots more. The first thing you should do is download Doug Baldwin's guide to sous-vide. It will save a lot of heartache. In short, for steak, if it is a decent cut you only want it to be in the bath to bring it up to temperature. Leaving good steak (ribeye, filet, porterhouse, new york strip steak and the like) in the bath for a long time will result in a mediocre steak. For sublime steak, put it in the bath for an hour or so at the temperature of your preference from 125 to 135 and then sear it. Since bacon won't do anything interesting at these temperatures, I would leave it out of the bag. For searing I would either use a very hot pan for 45 seconds (or even less) per side or use the torch. Bacon really turns out best when cooked at a lower temperature than is optimal for flash searing. So, I would leave bacon out of the process entirely. Also, I recommend using the search this topic field at the lower-left of the page -- you will find a lot of advice about cooking steak. To my palate (and those of almost everyone that I have served) a thick GOOD QUALITY ribeye done sous-vide at 128F and then quickly seared is a great experience. If you leave a good steak in a bath too long, the quality deteriorates noticeably after a few hours. Regarding the steak, listen to what e_monster said. I also agree with e_monster's recommendations. The rough "rule" about food safety (see Douglas' guide) is that if you cook anything below 55C or 131F (or is it 130F / 54.4C - but you get my drift) you should not exceed 4 hours. 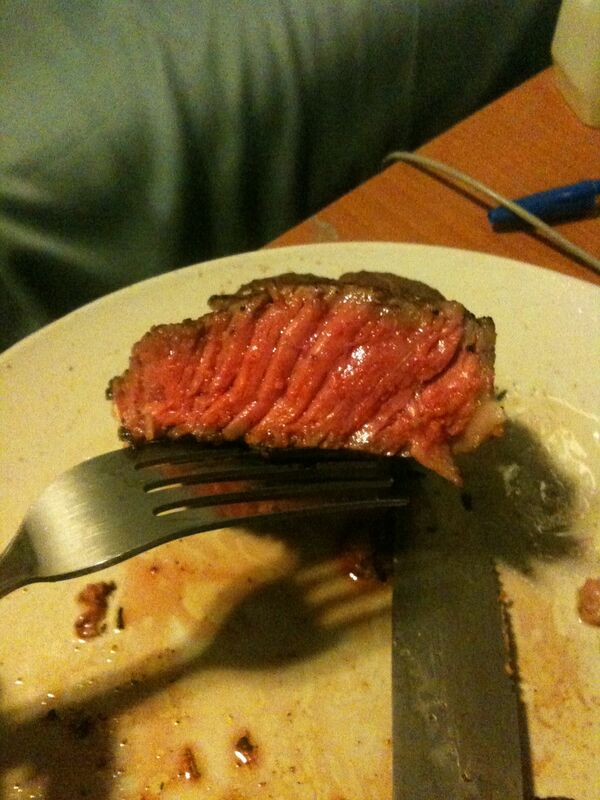 Given I like my steak on the rare side of medium rare I mostly cook it at 52C / 125.6F so I never exceed 4 hours. Mostly I use Douglas' tables to ensure I get the centre of the steak up to temp, but so long as I cook for at least that time and do not exceed 4 hours all will be well from a food safety perspective. The net of this is that I have never had a steak which didn't turn out fantastic. If on the other hand you are cooking something really tough like short ribs set your temp at 55C or higher and cook for days if you wish. I recently fed some sceptics 48hour beef ribs (meat off bone) cooked at 55C. They were amazed at the excellent taste and texture and appearance. Thanks for the help! That lobster recipe looks delicious. So it sounds like my main problem was just cooking a tender piece of meat too long. I almost always do fillets or ribeyes so it sounds like for ribeyes (about an inch thick) I should shoot for about an hour at 125 and see how that goes, then for the fillets (2inchs or so usually) at least 3 but no more than 4 hours. I'll give that a shot this weekend. I like the flavor the bacon adds to the fillet but it sounds like doing it completely separate is the way to go. Is it common to have significant liquid (enough that you can feel it's weight and pour it out into a cup) from the meat inside the bag? Do you do anything with that (other than sauce), such as is there a way to put it back into the meat? Is it safe to use? Like can I use the butter/liquid left after the lobster is done to saute some mushrooms or something? Like can I use the butter/liquid left after the lobster is done to saute some mushrooms or something? welcome to the sous vide community! And listen to blackp !
. This is probably why well-seared meat is often credited with greater juiciness despite the fact that searing squeezes more of the meat's own juice out. Above all else, searing intensifies flavor by means of the browning reactions, and intense flavor gets our juices flowing. You may enhance continued juiciness by spicing or marinating your meat before bagging, or eventually by larding or injecting oil, see , or by serving it with a spicy sauce. 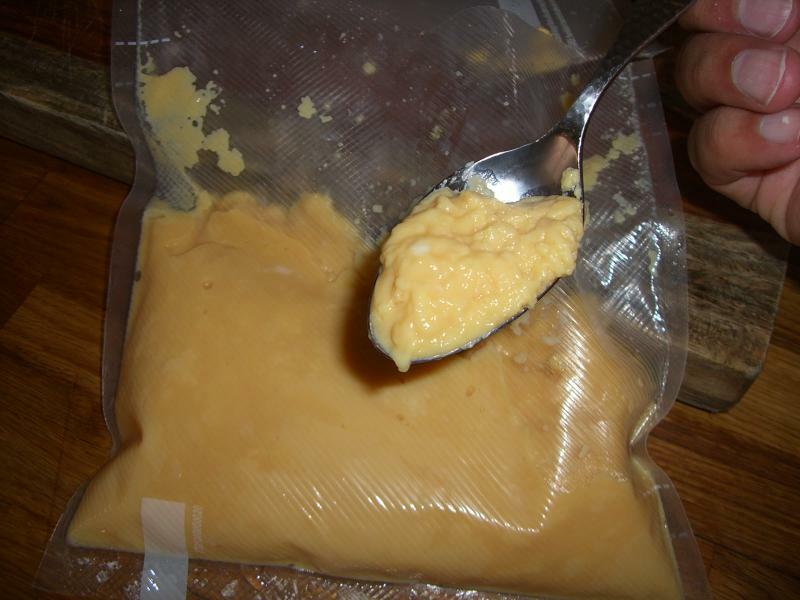 Longtime cooking will lead to liquid loss up to 20%, and it is worthwhile using the gravy (which is especially tasty when the meat was dry-rubbed or marinated) immediately for a sauce or preserving it in a screw cap glass by heating in the microwave to pasteurize (with the cap only loosely closed to allow steam to escape), cooling rapidly in ice-water and keeping it refrigerated. ... it is worthwhile using the gravy (which is especially tasty when the meat was dry-rubbed or marinated) immediately for a sauce or preserving it in a screw cap glass by heating in the microwave to pasteurize (with the cap only loosely closed to allow steam to escape), cooling rapidly in ice-water and keeping it refrigerated. Wouldn't the glass crack if you plunged it straight into ice water? I've done this many times, by microwave or in a bain marie, and the glass never cracked. Sous vide cooking of tender cuts of meat may give results equal to or at best a trace better than skillful conventional cooking; the advantage is fool-proof achievement of the desired doneness, and that you are flexible when to take your meat out of the water bath after the minimum cooking time (see guru Douglas Baldwin's Practical Guide http://amath.colorado.edu/~baldwind/sous-vide.html ) or an hour or two later, but extended cooking times will lead to more liquid loss and at worst dryness and a mushy texture. I just want to add a little emphasis to Pedro's point that might be lost. With sous-vide, just about anyone can prepare a perfect steak that is the equivalent of one prepared using traditional means by a skillful chef (a perfect steak by traditional means requires a lot of baby-sitting and is easy to overcook). 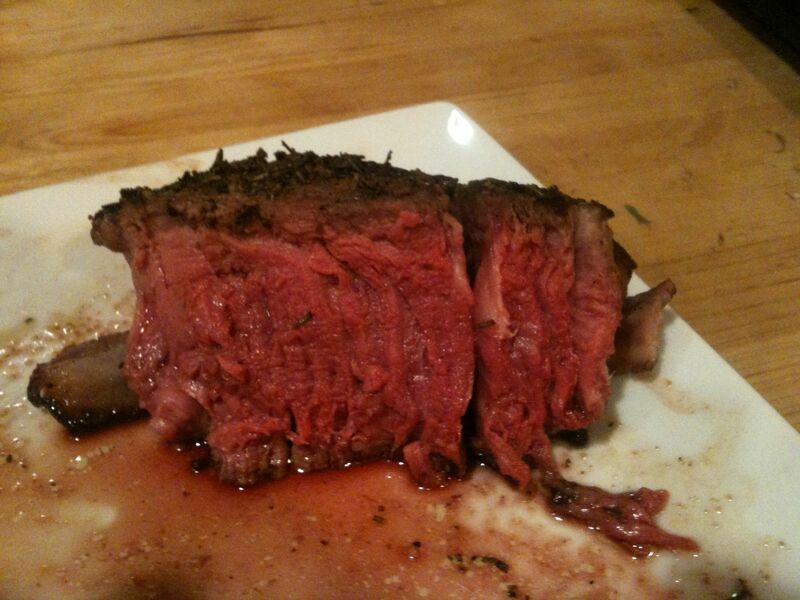 People that we have served our sous-vide/torch-seared ribeye consistently say that it is the best steak they have had. I am sure that if you use Alain Ducasse's traditional method that you will get one just as delicious -- but that requires that the steak have been brought up to room temperature followed by about 45 minutes of active participation including baby-sitting the steak on a medium-low flame and if you don't pay attention you burn the butter and ruin the steak or you over or undercook it. Also, that method really requires a steak at least 2 inches thick for the center part to not get overcooked. With sous-vide, the only critical issue is not leaving it in the bath too long and then searing it quickly so that you only brown the outside. But once you have done it once or twice, it is hard to mess it up. Anyway, that is my feeling. It's worth noting that this osmazome (the liquid exuded from the meat by cooking) needs to come to a simmer in order to coagulate out the various substances that don't coagulate at the lower temperatures used for sous vide cooking. Otherwise you can end up with an unattractive, cloudy scum in your sauce. I find that the easiest thing to do is cut a corner of the bag and pour out the liquid into a small saucepan; then bring the liquid to a simmer long enough to coagulate the scum; then pass it through a fine sieve. 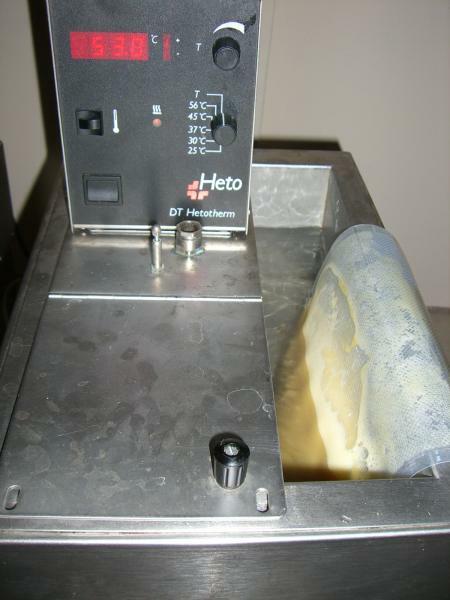 This typically yields a clear, particle-free liquid that can be used straight away in a sauce or saved. As for saving it, I have a hard time understanding why one would go to all the trouble of trying to "pseudo-Pasteurize" it in the microwave. Just put it in the freezer. 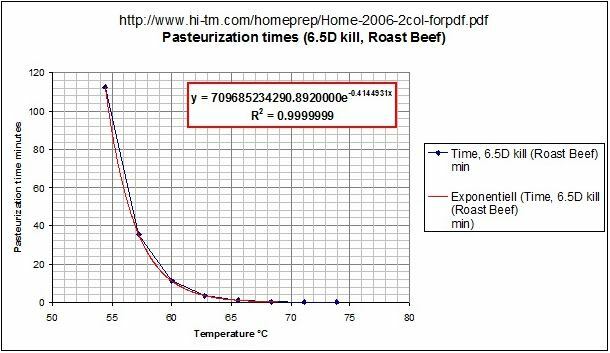 I think microwave-boiling is not "pseudo-pasteurization", it is pasteurization in the fraction of a second; pasteurization time at 80°C is 0.17 sec, so near the boiling point it is almost nul, only spores may be left, and by rapid cooling you prevent outgrowth of spores. It also coagulates the scum, and you may pass it through a strainer (mandatory for a nice clear sauce). For deglazing I use it without sieving and I did not notice any adverse effect. Of course freezing is safe, but keeping in the 1°C-compartment will do for a few weeks and the gravy is available spontaneously without thawing. In an earlier post (link here), I explored extracting osmazome from sous-vide cooked mince. The pictures go through the process of extracting the osmazome from the liquid in your sous vide bag. More recently, I just heat to coagulate the scum and then filter it through muslin only once. Like slkinsey, I also freeze this. This is done in an ice-cube tray with the resultant cubes stored in a zip-lock bag. You can then take out an appropriate amount to use in sauces. OK, been experimenting quite a bit with some successes and some failures. Experimenting on temps, amount of product in the 35 cup Rice Cooker with SV Magic ("Water Oven") and struggling with new ziplock bags and learning to use foodsaver. Cooked short ribs, prime brisket, spare rib cuttings, and chicken breast. First of all, has anybody else noticed that the ziplock double zip freezer bags have changed? Now, not only is the zip portion double, but there is a liner bag inside of the bag. This makes removing air really really difficult. Has anybody figured out how to get the air out of these new bags? This forced me to take out my foodsaver (does not have the "pulse" button) and really making the SV process much harder than before. I need to score some of the "old" ziplock gallon freezer bags. 1. Short Ribs. After trying short ribs at Providence and then Cache here in Los Angeles, I can proudly say that neither of them are as good as the SV short ribs. Both efforts tasted more like pot roast then the wonderful steak-like texture from SV short ribs. Let alone, I have found that if you go to the Costco Business Center (different than the regular Costco -- targeted to restaurants, delis, etc. ), you can buy 10 to 15 pound choice boneless short ribs for $2.69 per lb. These ribs are double to triple the size of the short ribs I get from the regular Costco and I can trim them the way I like. They're also $0.80 to $1.30 per lb. cheaper than at the regular Costco. If you can use the entire case (75 lbs), then it drops to $2.49 per lb. Nothing special in the prep -- granulated garlic powder, onion powder, salt, pepper, fresh thyme, marjoram and rosemary and a nice slab of salted butter. 131F for 48 hours. On 1 effort, I tried it without the butter as suggested by Kenji Alt in the Serious Eats blog but for my taste, I do like the extra fat from the butter in there assuming you are aggressive in trimming the fat from the meat. The other effort had the extra butter and I decided I like it better that way. 2. Brisket (prime). Another "find" at Costco Business Center -- $3.19 per pound for USDA Prime brisket. This effort followed Kenji Alt's advice and so, it was trimmed aggressively, granulated garlic powder, onion powder, thyme, rosemary, marjoram and no butter. I bought some mixed herb plants at Costco a couple weeks ago and went a little heavy handed on the herbs on the brisket. Cooked at 135F for 48 hours. I typically cook brisket, pork shoulder, and tri-tip at 131F. The purpose of cooking it at 135F instead of my typical 131F was to see how different 4F degrees would make on the finished product as well as to see if there would be additional collagen breakdown. When I pulled it, there was lots of liquid in the foodsaver bag -- 1/2 way up the bag. I cut the bag, drained the liquid into a sauce pan and boiled/strained the liquid and saved for later. The meat came out much too herby. Lesson learned -- do not use too much fresh herbs in SV. I know that this topic has been written about before but I learned first hand this time. Also, I learned that there is significant difference in perceived "juiciness" between 131F and 135F. The brisket was incredibly flavorful (too much herbs though) but next time will be done at 131F and for 36 hours. My alternative preparation on SV Short Ribs is to do my version of kalbi marinade with less salt, honey instead of sugar, worcestershire sauce, soy sauce, ginger, scallions, and a touch of sesame oil. I also do this with flap meat which seems to have jumped in price over 30% in the last 3 weeks. 3. Spare Rib cuttings. Typically, when I do ribs, I take a whole spare rib slab and cut it into St Louis Style ribs and then save the cuttings. They're great for stews, chili, nachos, or anything you might want pork shoulder/carnita like meat. Salt, pepper, gran garlic, onion powder, thyme, marjoram, and rosemary. Cooked it at 135F for 36 hours. Came out GREAT!!!. Just gnawed on the soft cartiledge and the meat was super flavorful and juicy. The meat came out like I wanted my brisket to come out. So, lesson learned -- higher temp on the fattier pork cuts (so not for pork chops or pork loin) results in better break down of the collagen without losing any juiciness. 4. Chicken Breast. Brined whole chicken breast, bone in, skin on, for 4 hours. Rinse, drained, added thyme, rosemary, marjoram, and foodsavered it. Cooked it for 2 hours at 135F with the Spare Rib cuttings. Took it out at the 2.5 hour mark and threw it immediately into the fridge for dinner the next night. I had previously done chicken breast at 140F for 3 hours and it came out fine. This time, I throw the chicken bag in to the Water Oven (with the spare rib cuttings that are still cooking) for 20 minutes to warm up. Take it out and make preliminary cut and totally raw on the inside. Not a little pink -- totally raw. Oh well, spare rib cuttings look good so I crank up the oven at 300F, and throw in the chicken breasts for 25 minutes. Came out great. 1. Temperature really matters. Certain cuts of meat, like fattier pork cuts, benefit from higher temperature. Other cuts of meat, even though it might be USDA Prime, like this brisket, prefer the lower temperature. 5F for cooking chicken is the difference between perfect and raw. 2. Need to learn how to use foodsaver or better yet, find old stock of ziplock freezer bags. 3. Amount of food cooking at one time matters. Stacking of food in Water Oven needs to be done carefully. One of the reasons why I believe the chicken was so raw was that I had the spare rib cuttings and the chicken cooking at the same time. I'm going to need a water bath and circulator before I can successfully SV larger amounts of food at the same time. 4. Less is better when using fresh herbs. I tried the same 93% fat burger at 56c and as you said it is coming out very much as a different thing. Well worth the wait, turned the burger from meh into something great I didn't want to stop eating. Glad that helped. You can individually pack your burgers and pasteurized a bunch at once. Then rapidly chill following the instructions in Doug Baldwin's sous-vide guide and freeze them. That way you won't have to wait so long when you want a sous-vide burger. Then when you want to eat a burger you won't have to leave then in the bath so long since they will be already pasteurized. I also recommend experimenting with some ground chuck that has a somewhat higher fat content, too. 4. Chicken Breast. ... Took it out at the 2.5 hour mark and threw it immediately into the fridge for dinner the next night. ... I throw the chicken bag in to the Water Oven ... for 20 minutes to warm up. You'll get a much faster (thus safer) quench, if you chill it in cold water. Even better is the advice to use ice with just a very little water. And also, by using water, you avoid warming up all the other stuff in the fridge. Very good point. Just out of laziness. Now, a safety question. Let's assume you screw up like me and put it in the fridge or even leave it outside for a while. 1. Cooked for more than 4 hours (or the minimum based on temp and size of meat) following Doug Baldwin's tables and believe to be fully cooked. My understanding after reading Doug Baldwin's guide and this thread is that safety issues at that point are no different than safety issues with any other fully cooked food. So, there's no increased danger than if you serve chicken and leave it out on the table for 2 hours and then throw it in ziplock and into the fridge as leftovers. 2. Cooked less than the minimum. Now you have raw (or not fully cooked) product. Like me, you don't chill it and you just put it straight into the frig. If you finish this at 300F for sufficent cooking time to bring chicken to 150F using a meat thermometer, is this piece of meat safe to eat? Obviously, this does not work with red meat unless you like eating red meat at 150F, but I typically cook chicken to 150F or higher when cooking conventionally. Thanks again for all the tips. I did some more expiramenting and learned that time is a big factor with SV cooking. I did some salmon for lunch today at 120 for 20 minutes which was amazing. It was almost a creamy texture, simply awesome. Again my crappy iphone picture, but you get the idea. It looks smaller in the picture than it was, but that's right at about an inch thick. You can see the juice and the pink from end to end. Delicious. One interesting tidbit though was on this ribeye I did trim the fat on the plate. I normally don't do that at all. The fat was very white in color and mushy, it just didn't look done or appetizing. When I grill these I usually eat them fat and all. What I found, was that the fat was actually really delicious, it was just a mental thing preventing me from eating it. I do steaks all the time but almost always ribeyes or fillets. I think this might give me an excuse to try out some NY strips or some of the leaner cuts. I also want to try some different seasonings. I used my normal stuff on this one and it was good, but not quite as good as when grilled, the meat itself was better quality, but the overall taste just didn't fit the seasoning. Its been a while since I posted on this thread. 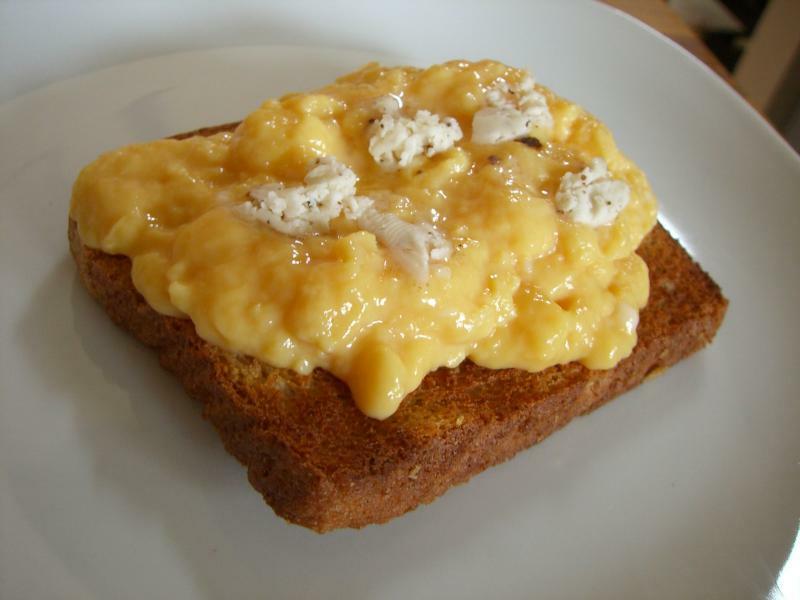 I love breakfast, so decided to make soft scrambled eggs. Blend 6-8 fresh eggs with a splash of half and half and a pinch of salt. 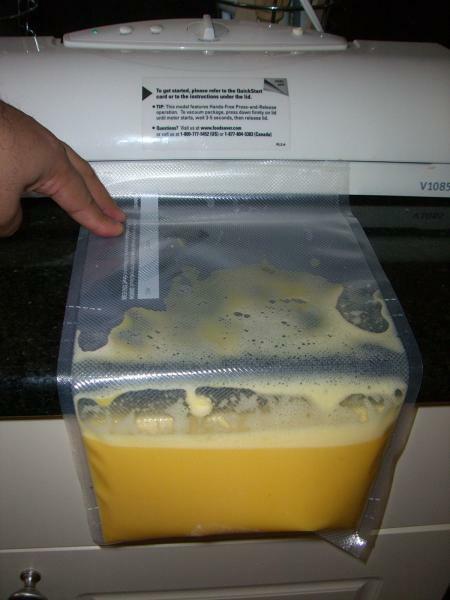 Place blended eggs in a food grade bag with a long neck and vacuum seal it (you can place bag over the countertop and seal it. Placed it in the water bath. Started at 68 deg C and slowly kept increasing the temp until the eggs started to get to the desired consistency. For me that was between 72 and 73 degrees. The consistency of the eggs once they came out of the water bath and were cooled. The eggs were super rich and err...eggy. There was a custard like consistency which made the eggs jiggle a bit even on the spoon. Beautiful. and what better way to use up some leftover Taiwanese pork belly and Sichuan chili chicken. When you seared, did you make sure to sear the fat nicely? 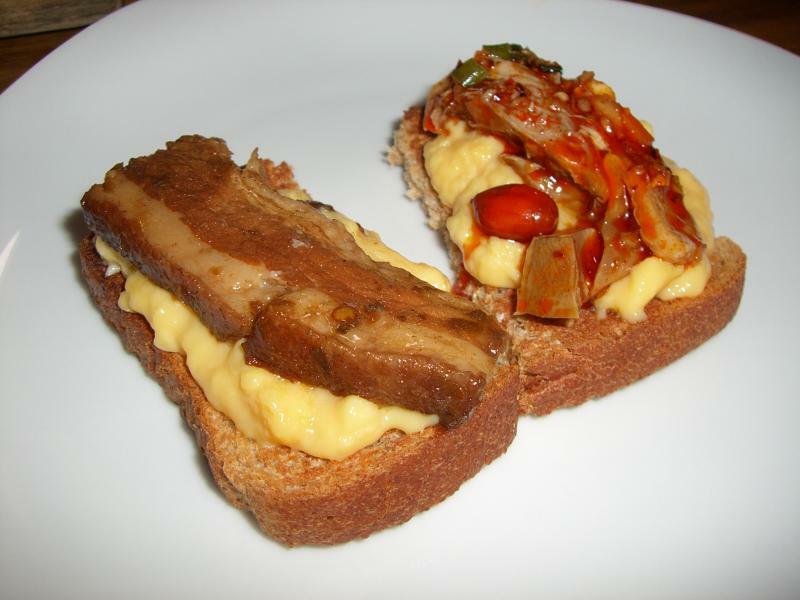 It can be browned nicely with a torch and has a delicious flavor. Just a quick note that I did some experimenting with Snake River Farms Wagyu brisket cooked at 134 for 25, 31, and 48 hours. We found the differences between the 24 and 48 hour wagyu to be fairly minimal but preferred the 24 hour version as it was slightly juicier than at 48 hours -- but both were delicious and quite tender. The Wagyu brisket is the only one that I have cooked that was tender enough after 24 hours to be considered a success. It was bagged with a few tablespoons of 6% brine and a cap of liquid smoke. Next time, I will put two caps of liquid smoke. We ate it with creamed horseradish. We also had some 48 hour boneless short ribs last week, and we have decided that we like them more than the brisket. The brisket is great but there is something about the short ribs that is almost sinful. Yeah, I got as much of the fat as I could around the edges. The main issue was the fat on the inside of the steak which I could only get the top and bottoms of.